European Commission (Commission) has referred the UK to the Court of Justice of the European Union (CJEU) for its failure to comply with limit values for nitrogen dioxide (NO2) ‘as soon as possible’. France and Germany have also been referred to the CJEU on NO2. Hungary and Italy have been referred over persistently high levels of particulate matter (PM10). The Commission has also sent the UK a first written warning for disregarding vehicle type approval rules. “Europe at its ‘best’ is taking the UK at its ‘worst’ to Court on nitrogen dioxide (NO2) air pollution. Hurrah! 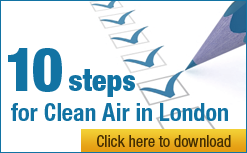 “Clean Air in London (CAL) congratulates Commissioner Vella on referring the UK to Court. Let’s hope it’s jail for ministers not fines if Michael Gove, Chris Grayling and Theresa May continue to flout these laws! “This enforcement action against the UK is much needed. The UK has failed repeatedly to comply with NO2 limit values in legislation since 1999 to be complied with by 1 January 2010. “Cities must ban diesel vehicles as we banned coal burning in ‘Smoke Control Areas’ so successfully with the first Clean Air Act in 1956.